Just give that boy the flashy beast! He can be the official Blogville Photographer! It looks like you have another nose! CHEEEEEESSSSSSE to you too Edward. Have a wonderful Wednesday. New photographer in town LOL. Have a great day. CHEEEEEEEEEEEEEEEESE..... We are showing our Teefs and stuffs. We did NOT know that you were a Master of the Flashy Beast, Edward. That is so cute! Cheese! We found you through Wordless Wednesday! Check our blog out some time? We have never ending adventures in stock! Oh no ... Lily you better hide! oh wait, Edward I have to primp up my hairstyle first :o) have a great wednesday! Shiloh here - I just got my toofiez cleaned yestaday so I iz all ready fur my head shot. Diva Shastta here - oh dear, where iz my boa? A diva MUST haf her boa when the puparazzi are around. Hope Edward got lots of pawsome photos with the flashy beast. Are you taking incriminating photos of Lily? Did you take a good picture of her? That's it, Edward! Now you can take embarrassing pictures of your mom....bwahaahaa! Are you serving WHINE with that cheese Edward???? Turning the tables on your mom, huh, Edward! A new photographer in the family? Way to go, Edward. Wow, your peep got a pix of you taking a pix! BWAR HAR HAR That's fun and I bet you take excellent photos. You and Lily will make a great team! A new photo bug, no wait....... thats Edward the paparazzi guy! I'll bet Edward is a great photojournalist! We are all lined up and smiling for you, Edward - you had better have a tasty treat for us. 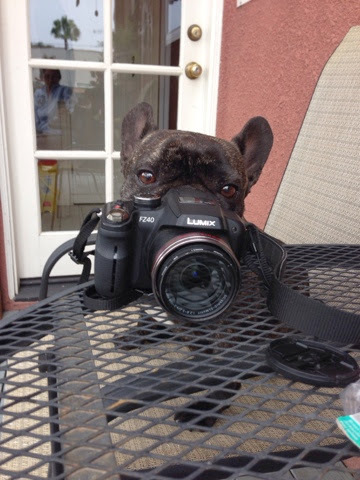 Oh gosh- your a little photographer! OK I am eating cheese, take my picture. Wow, I can't wait to see your work! I'm saying "Cheese" Edward ... oh wait ... is there cheese?? I want some Cheese? See you later Edward I'm going to get us all some CHEESE! Edward! I didn't realize you were a photographer! You're so multitalented!